The following graphs are something I plan on leveraging more from in the future, however for now I just wanted to share. These compare the past two recessions across states and then the initial few years of expansion following the bottoming out in the local labor markets. 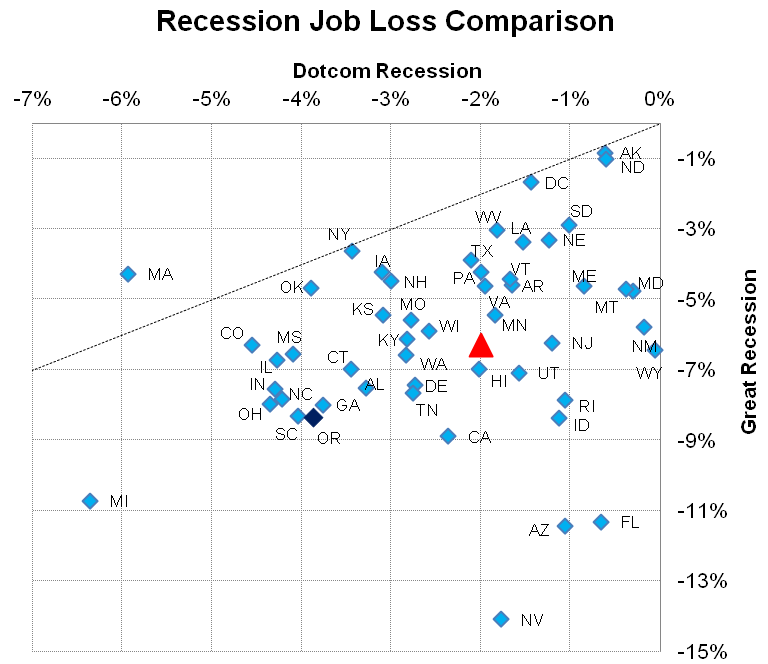 This first graph shows job loss from each state’s individual peak to their individual low point for both the dotcom recession and the Great Recession. The dotted line is the equal value line, which if a state landed on it would say that their job losses were of the same magnitude in both recession. A few states, such as Oklahoma, New York, Wash DC, Alaska and North Dakota had approximately the same size cycle for each recession. Massachusetts is the only state in the country that had a worse tech recession than Great Recession. However for the vast majority of the states, the Great Recession was much more severe than the dotcom recession, as to be expected. Another way to think about this graph is all the states to the lower left of the red triangle (that’s the U.S.) had deeper recessions each time, and generally have more volatile economies than the national average. States to the lower right of the red triangle had a more mild dotcom recession but a more severe Great Recession and you can see the largest housing bubble states here, which largely skirted by in 2001 with small losses. On the upside, there are many more states that are closer to the equal value line than in the job loss comparison above. This indicates that many states are currently expanding about the same rate they did coming out of the tech recession, just as the housing bubble was beginning to inflate. This is interesting in that the rate of growth today isn’t that much slower than the start of the last expansion, however when the cycle was deeper and lasted longer, seeing the same rate of growth is disappointing and makes for a long, hard road back to pre-recession levels. Furthermore, the mid-2000s expansion itself was slower than the historical economic expansions, so saying we’re close to that is not much comfort. 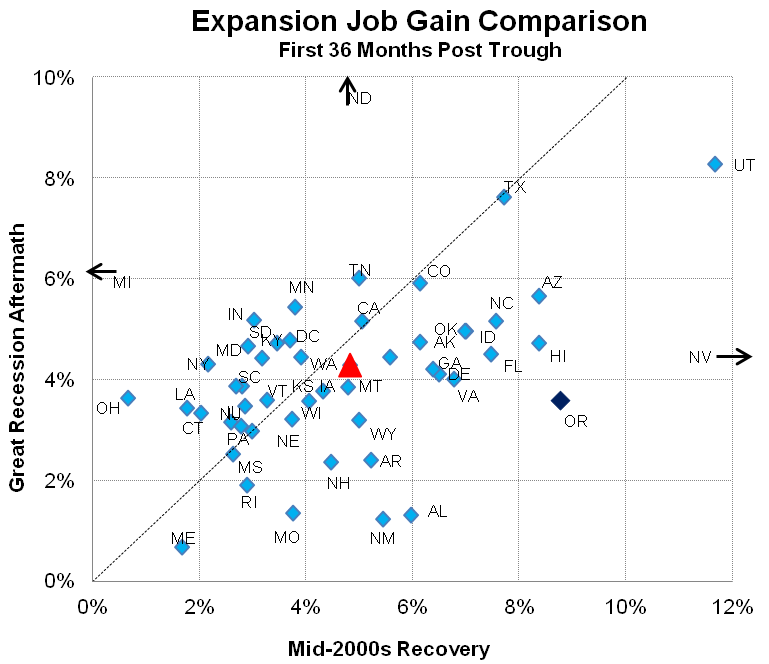 Additionally, one can see Oregon had the 3rd strongest initial expansion coming out of the dotcom recession, trailing only Utah and Nevada, however so far in the aftermath of the Great Recession Oregon ranks about in the middle of the pack, just trailing the national average (34th to be exact). Lastly, given we know Portland had a much more severe dotcom recession and is leading growth today, I thought I would breakout Portland with the rest of the state. It is interesting to see that while the depth of the tech recession varied across the state, the depth of the Great Recession had less variation between Portland and all other areas. 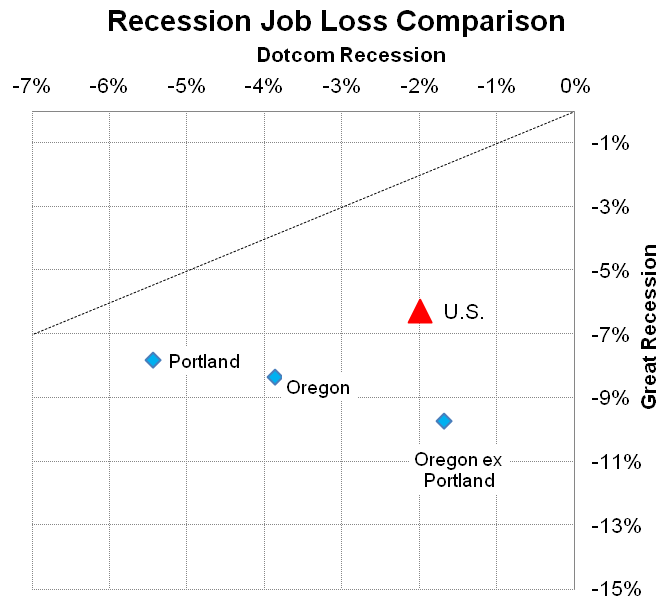 Similarly on the upside, the growth coming out of the tech recession was similar in Portland and the rest of the state. 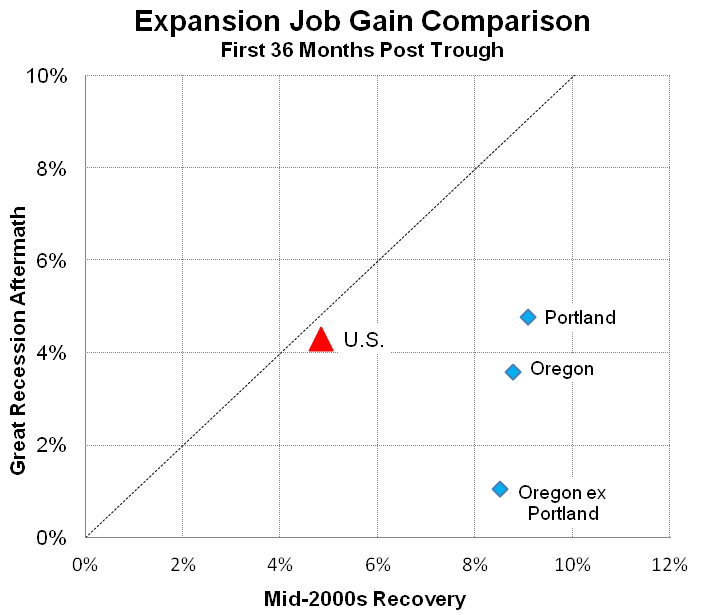 The last point I’ll make today is that the Oregon ex Portland growth of about 1% has all come in the past year, so there has not been a full 3 years of labor market expansion, so for as long as the recovery continues, the job gains will become stronger across the state.